Wild: Utahraptor Prime is an incredibly aggressive species of Utahraptor found on the island. It tends to travel in small hunting packs, attacking smaller prey with its sharp teeth or enlarged foreclaws. 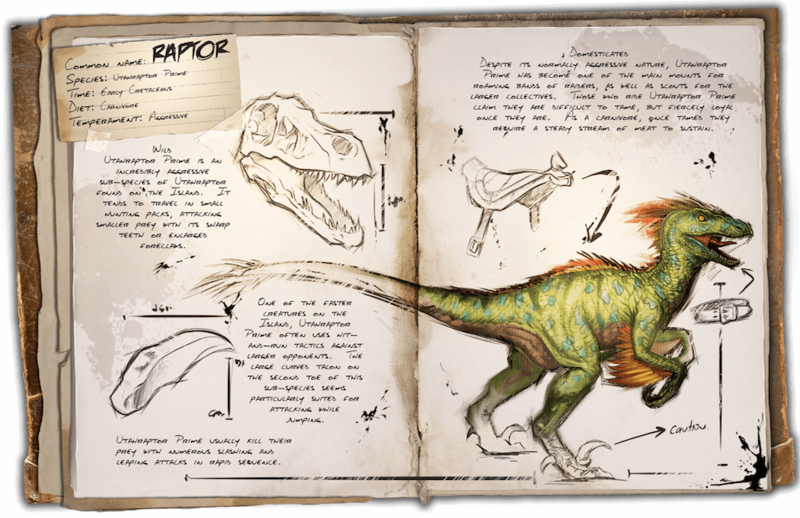 Domesticated: Despite its normally aggressive nature, Utahraptor has become one of the main mounts for roaming bands of raiders, as well as scouts for the larger collectives. Those who ride Utahraptor claim they are difficult to tame, but fiercely loyal once they are. As a carnivore, once tamed they require a steady stream of meat to sustain. Known Information: One of the faster creatures on the island, Utahraptor often uses hit-and-run tactics against larger opponents. The large curved talon on the second toe of this sub-species seems particularly suited for attacking while jumping. Utahraptor Prime usually kill their prey with numerous slashing and leaping attacks in rapid sequence.